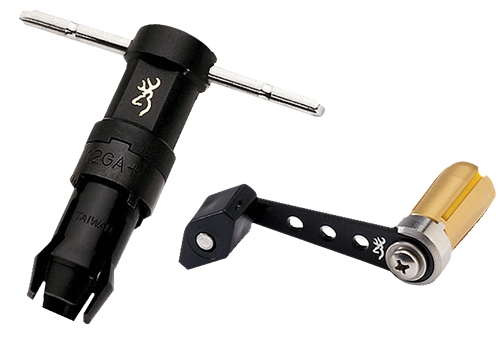 There are several different types of choke tube wrenches to use with Browning Choke tubes. Since Invector, Invector Plus, and Invector DS have different choke designs, it is important to select the correct wrench for removing and reinstalling your shotgun's chokes. The Speed Wrench is ideal for sporting clays, since it allows for quick and easy choke removal in the field. The T-Wrench, available in both Invector and Invector Plus allows more torque to be applied with greater leverage--this is ideal for chokes that have experienced heavy shooting and might be a little sticky. 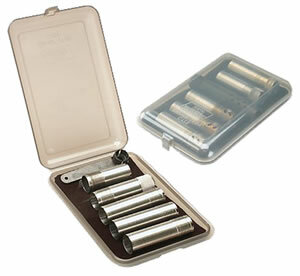 The flat wrench design has slots to fit different caliber tubes, so it is convenient to have on hand. Many extended tubes are easy to remove with fingers, but most have the wrench slots hidden on each side that accept the correct gauge wrench.